Fantastic Fest always plays host to the best and most interesting genre films from around the globe, and this year was no different. The Austin-based film festival showcased a particularly eclectic lineup this year and among that lineup were three of the best science fiction movies to come around in ages: the game-changing Gravity, the tiny indie Coherence and the thoughtful, mesmerizing The Congress. It's safe to say that Alfonso Cuaron's Gravity does things that we've never seen done in a movie before. That may reek of hyperbole, but there's no other way to say it. This is next-level filmmaking. This is a director setting out to rewrite how you can tell stories on film and redefine the filmmaker's toolkit. Technically speaking, Gravity is one of the most impressive movies ever made, pushing what its medium is capable of into a bold and dramatic new realm. No film has ever looked or felt like Gravity, but like Star Wars and Blade Runner before it, it's going to inspire an entire generation artists (and plenty of knockoffs). For a film whose technology, composition and storytelling are appropriately otherworldly, it's shocking how simple the story actually is. 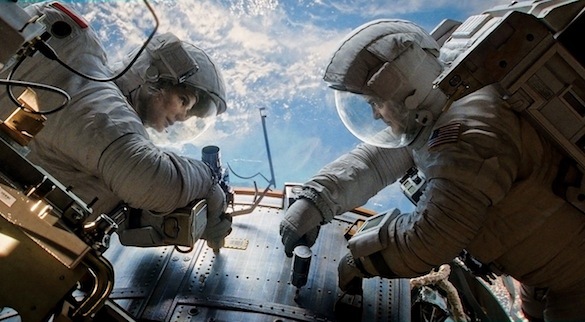 Set in Earth's orbit, Gravity follows two astronauts (Sandra Bullock and George Clooney) whose shuttle is destroyed by a deadly debris field, forcing them to embark on a quest to survive in a place where life is literally impossible. The screenplay is as direct and lean as they come: our heroes want to live and they suffer through all manners of trials and setbacks, finding themselves pushed to the breaking point on several occasions, only to find a tough challenge just around the corner. If you were to criticize Gravity, the script may be the easiest thing to poke at since it doesn't have as much on its mind as you'd imagine. However, context is key here. While this is a rather straightforward survival film, it's a rather straightforward survival film set in a soundless vacuum where you can barely control your own movements and where oxygen is a luxury. In other words, Gravity is a stressful movie. Even the most familiar of beats (particularly certain revelations about Bullock's character) are given profound weight because you've never seen a movie where the danger to the lead characters has been this tremendous. You can't fight space. You can't just walk out of space. In space, no one can hear you scream, but they also can't hear you slowly run out of oxygen while you drift toward the slimmest hope of salvation, always aware that an orbiting field of debris could silently come out of nowhere and kill you instantly. It's a good thing Gravity is a brief 90 minutes, because anything longer would give you a heart attack. As he did with Children of Men, Cuaron utilizes lengthy takes and gorgeous compositions, but his work here is just otherworldly. It's impossible to watch Gravity and understand how it was made (the best answer is that they actually went to space) since the camera acts like it's in a zero-gravity environment, doing things that simply look and feel impossible. Also impossible? Bullock's performance. As likable as she has been over the years, it's impossible to watch Gravity and not wonder where the hell this version of her has been all of this time. It's a difficult performance and Bullock is what ultimately justifies all of Cuaron's technology. Gravity could have been all amazing flash, but she gives it the soul. Like space, this is a ruthless and cold film, but Bullock gives the movie its pulse. This is one of the best science fiction movies in years. Small science fiction can be tough. This is a genre built on the idea of unlimited imagination, so many of the best sci-fi ideas tend to be big, expensive and impossible to produce on an independent budget. But then something like Coherence comes along, makes you slap your forehead and get a little ashamed that smart, lo-fi sci-fi is so rare. This is a film that makes it look easy. The setup is straight out of The Twilight Zone. A group of friends are having a dinner party on the same night that a mysterious comet is passing overhead when their power goes out. They realize that only one house on the street has power, so a group goes to investigate. And then things get weird. To say much more would to do the film a disservice, but let's just say that it becomes an increasingly unpleasant night for everyone involved. Like the thematically similar Primer, Coherence is a film that you want to go into as blind as possible. Unlike Primer, Coherence is a little shaggy and rough around the edges when it comes to its actual science. Although Shane Carruth's time -ravel gem offers the easiest comparison, Coherence is a bit clunkier in establishing exactly what's going on, with a very convenient quantum physics textbook popping up to provide a cast of scientific laymen with a few too many easy answers. But once that clumsy exposition is out of the way, Coherence transforms into a dark and troubling thriller about choice and how our decisions make us who we are (and, more importantly, who we aren't). Sure, it's easy to complain about how the science fiction of this story is introduced, but you can't argue with the results -- this is a morality play that is only possible with the help of the impossible. Coherence is the feature debut of director James Ward Byrkit, and he makes it all look easy. With his attention to character over detail, Byrkit's work feels like a cousin to the science fiction of the '50s and '60s, a character- and idea-driven story that would feel right at home alongside the best of Rod Serling and Ray Bradbury. For its faults, it's still a smart breath of fresh air. You can do science fiction on the cheap. You've just got to be smart about it. Ari Folman's The Congress is a film so bursting at the seams with ideas and images and concepts that it threatens to overwhelm you. Few films are this jam-packed with stuff and few films have had so many intended targets. The Congress is about the role of the artist in the evolving cultural landscape. It's about social media's intrusion into our modern life. It's about how we hide behind avatars because we're ashamed of who we really are. It's about how nostalgia has replaced our desire for something new. It's about the power of celebrity and what we really value in the stars we love watching. It's about the dangers of unwatched corporate endeavors. It's about movies, the Internet, drugs, love, family and the future of each of those. And it's also a wildly entertaining and surreal animated/live-action hybrid that's as gorgeous as any film you've ever seen. There's no way to describe this film properly in a nutshell, but here goes nothing: Robin Wright stars as a fictional version of herself, an aging actress whose best days are behind her. A movie studio offers to "scan" her, a process that will create a digital version of her that will be forever young and will continue to be cast in movies forever. The catch is that she can never act again. Wright agrees... and then the film jumps 20 years into the future, where the actions of the entertainment industry have resulted in a world that's nothing short of terrifying (and where everything is animated). Once animation enters the equation, The Congress truly comes to life, taking the ideas of the live-action opening and taking them to the logical (and occasionally illogical) extreme. Like with his heartbreaking documentary Waltz with Bashir, Folman uses colorful animation to mask the bleakest and darkest ideas imaginable, putting hard truths in a friendly and stylized package. While Bashir used animation to represent the mental block war veterans put up to keep a wall between themselves and the things that they saw and did on the battlefield, The Congress presents a world where people deliberately escape into an animated fantasy to avoid reality for more selfish reasons. Both films deal with the power of fantasy, how mankind is ready and willing to lie to themselves, to become someone else, to avoid responsibility for what they have done. If anything, The Congress is a more cynical film -- when given the opportunity to literally ingest entertainment and become whatever they want, audiences take it. It's instant gratification. It's a dark look at a world where artists have been removed from the art, where everything is possible but nothing means anything anymore. What happens when entertainment becomes a full-time distraction and not a reflection of our world? The Congress asks this and the answer it provides is as bleak as anything ever put on film. There's a scene early on in The Congress where Wright's agent, Al (Harvey Keitel), tells her a story. It's a lengthy monologue, and for awhile it seems wildly out of place. In retrospect, it may be the key to understanding what the film is trying to say. During his story, Wright's response runs the gamut: she laughs, she cries, she's hopeful and she's defeated. It's storytelling at its most pure and simple -- one person sharing a story with another, face-to-face. As the film tracks the evolution (and perversion) of stories, we stop seeing reactions like this. We see rabid fanboys. We see consumers recreating their favorite characters and bits out of nostalgia. We see cinematic icons reduced to memes, references and avatars. As technology improves and as humans themselves are removed from the act of storytelling, cinema and art dies with it. 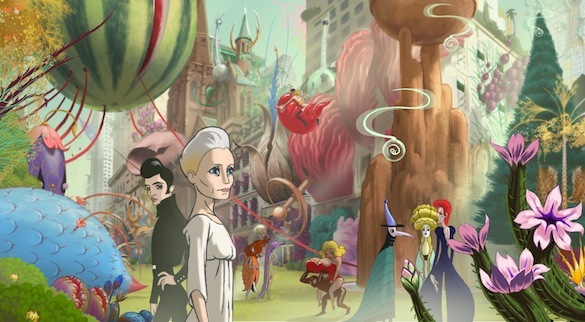 The Congress is going to win a lot of fans with its trippy animation and crazy concepts, but it's really a desperate cry for the movies (and actors) to keep on fighting for that human connection. The more the world changes, the further we drift apart from each other and ourselves. We need to fight for art and for artists. The day that we can't look each other in the eye and make each other laugh or cry is the day that humanity stops moving forward. The Congress is one of the best films to play at Fantastic Fest 2013 and it's one of the best films of the year.